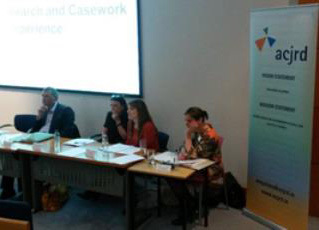 Fiona Murphy of the Irish Criminal Justice and Disability Network details its mission and recent activities. The Irish Criminal Justice and Disability Network’s (ICJDN) wants key agencies in the criminal justice system to be aware of the needs of disabled people in the Courts. The Irish Criminal Justice and Disability Network (ICJDN) is a recently established organisation. Its aim is to provide a national platform whereby disability organisations and criminal justice agencies can be facilitated to improve the experience of those with an intellectual, learning or physical disability that engage with the criminal justice system either as a victim, witness or suspect. One of the organisation’s key objectives is the provision of disability awareness training and education to key agencies in the criminal justice system. The ICJDN and the Association of Criminal Justice Research and Development (ACJRD) recently co-hosted a seminar at the Law Society entitled “Intellectual Disability and the Criminal Justice System: Recent Research and Casework Experience”. Speakers included Professor Shane Kilcommins, Head of the Law School, University of Limerick; and Dr Helen Goode, Senior Clinical Psychologist & Karen O’Driscoll, Speech & Language Therapist, both from The Dublin Adult and Child Therapy Centre. Audience members from various state, community and voluntary agencies actively participated in an interesting discussion, followed by a question & answer session, further highlighting the pressing necessity to explore and improve the experience of those with a disability engaged with the criminal justice system. This event was the first in a series of proposed seminars, and has resulted in the establishment of collaborations for training to a number of criminal justice agencies. Fiona Murphy initiated the ICJDN. Her background includes programme co-ordination and event management with the UCD Irish Centre for Commercial Law Studies and the UCD School of Law. She subsequently worked in the Director’s Office of the General Council of the Bar of Ireland and the Association of Criminal Justice Research and Development (ACJRD). Her qualifications are in public relations, communications and political communication.